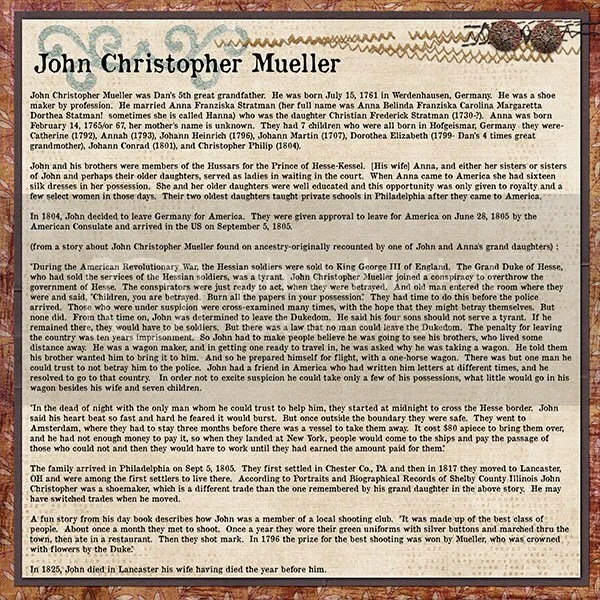 John Christopher Mueller was my husband’s 5th great grandfather. He was born July 15, 1761 in Werdenhausen, Germany. He was a shoe maker by profession. He married Anna Franziska Stratman (her full name was Anna Belinda Franziska Carolina Margaretta Dorthea Statman! sometimes she is called Hanna) who was the daughter Christian Frederick Stratman (1730-?). 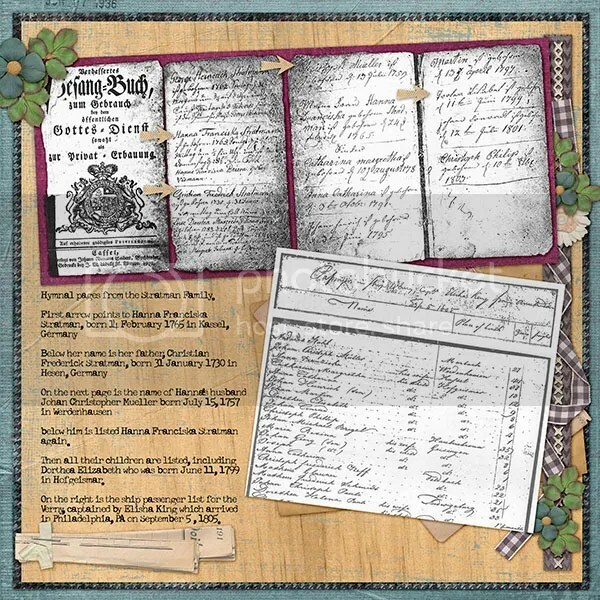 Anna was born February 14, 1765/or 67, her mother’s name is unknown. 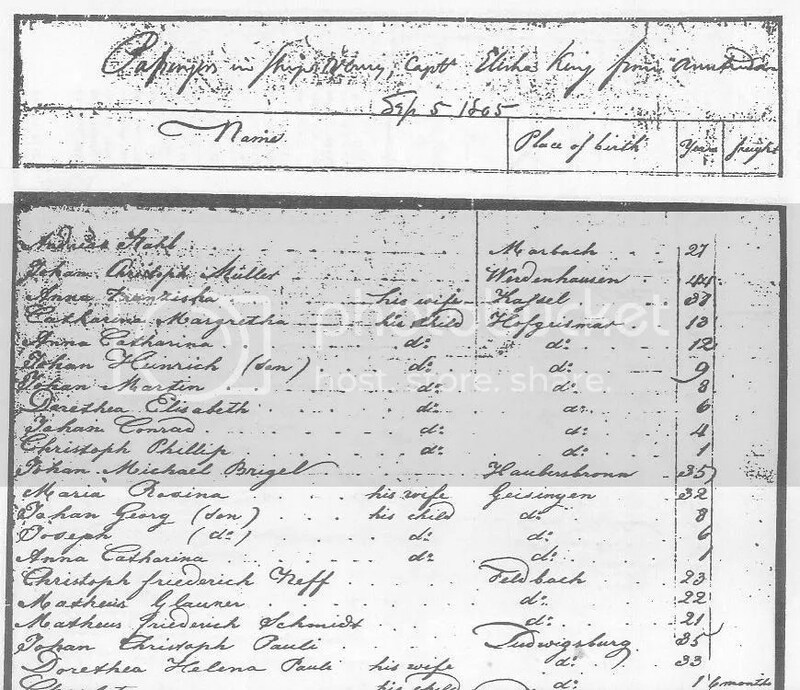 They had 7 children who were all born in Hofgeismar, Germany they were- Catherine (1792), Annah (1793), Johann Heinrich (1796), Johann Martin (1707), Dorothea Elizabeth (1799-my husband’s ancestor), Johann Conrad (1801), and Christopher Philip (1804). 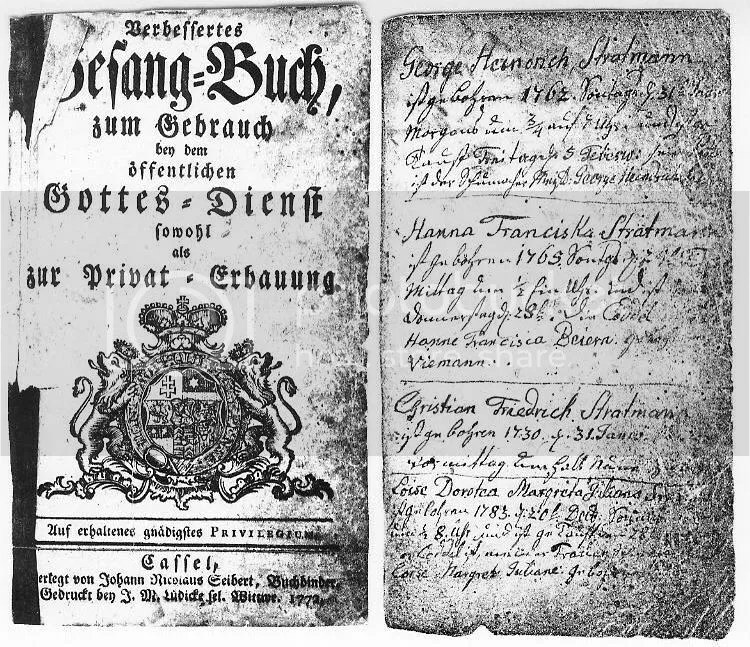 Hymnal pages owned by the Stratman family showing Anna Franciska’s birthdate as well as her father Christian Frederick Stratman’s birthday on January 31, 1730 in Heessen, Germany. John and his brothers were members of the Hussars for the Prince of Hesse-Kessel. [His wife] Anna, and either her sisters or sisters of John and perhaps their older daughters, served as ladies in waiting in the court. When Anna came to America she had sixteen silk dresses in her possession. She and her older daughters were well educated and this opportunity was only given to royalty and a few select women in those days. Their two oldest daughters taught private schools in Philadelphia after they came to America. “During the American Revolutionary War, the Hessian soldiers were sold to King George III of England. The Grand Duke of Hesse, who had sold the services of the Hessian soldiers, was a tyrant. John Christopher Mueller joined a conspiracy to overthrow the government of Hesse. The conspirators were just ready to act, when they were betrayed. And old man entered the room where they were and said, “Children, you are betrayed. Burn all the papers in your possession.” They had time to do this before the police arrived. Those who were under suspicion were cross-examined many times, with the hope that they might betray themselves. But none did. From that time on, John was determined to leave the Dukedom. He said his four sons should not serve a tyrant. If he remained there, they would have to be soldiers. But there was a law that no man could leave the Dukedom. The penalty for leaving the country was ten years imprisonment. So John had to make people believe he was going to see his brothers, who lived some distance away. He was a wagon maker, and in getting one ready to travel in, he was asked why he was taking a wagon. He told them his brother wanted him to bring it to him. And so he prepared himself for flight, with a one-horse wagon. There was but one man he could trust to not betray him to the police. John had a friend in America who had written him letters at different times, and he resolved to go to that country. In order not to excite suspicion he could take only a few of his possessions, what little would go in his wagon besides his wife and seven children. Ship list from the Verny which was captained by Elisha King. 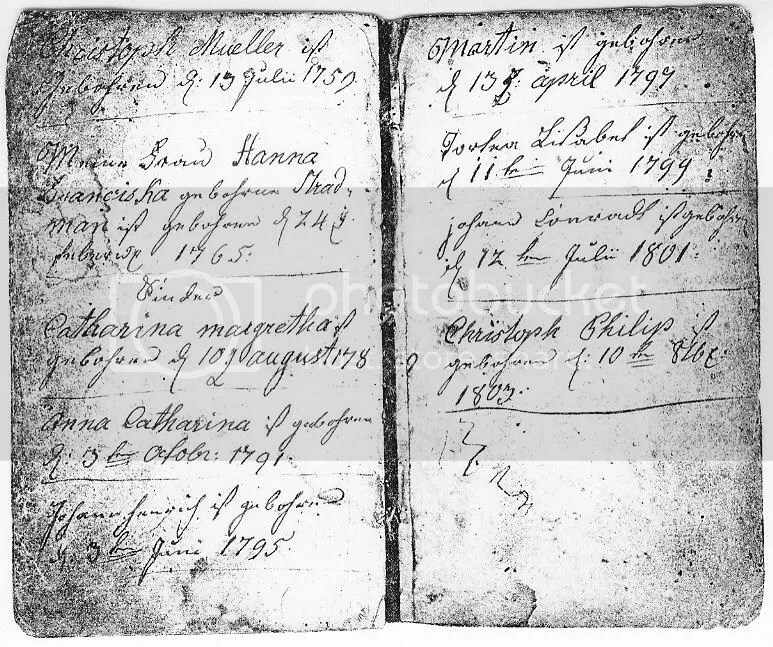 This list shows John, his wife Anna, and their 7 children, including my husband’s 4 times great grandmother Dorthea Elizabeth. They were given approval to leave for America on June 28, 1805 by the American Consulate and arrived in the US on September 5, 1805. The family arrived in Philadelphia on Sept 5, 1805. They first settled in Chester Co., PA and then in 1817 they moved to Lancaster, OH and were among the first settlers to live there. According to Portraits and Biographical Records of Shelby County Illinois John Christopher was a shoemaker, which is a different trade than the one remembered by his grand daughter in the above story. He may have switched trades when he moved. In 1825, John died in Lancaster his wife having died the year before him.